There are many ladies out there that hate the thought of autumn and winter rearing its ugly head. I for one, prefer the warm sun on my skin 24/7 but alas, I live in England and the colder months are fast approaching. When it comes to reinventing your wardrobe for September onwards, you can always expect the usual oversized knits and leather black boots to make an entrance but this season, something interesting is happening…A/W looks to be fun! 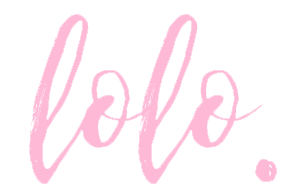 If you don’t believe me, have a little explore of this lovely lot of trends that will keep your style looking current, effortless and will show you have a sense of fun (and fashion) about you. Florals in winter? Well it’s a trend that always ducks in and out but really when the sun is low and the clouds move in, surely we all need a colourful reminder that flowers exist all year round no matter the temperature? L – R: Dress – Zara, Top – Topshop, Skirt – Saloni at NetAPorter, Bag – Topshop, Dress – Marc Jacobs at NetAPorter. When it’s too cold for cute cotton shorts – jeans are my go 2 best friend. A trend that will outlast us all, this season the workman’s cloth is going back to its roots and is retro, ripped and ready to wear. 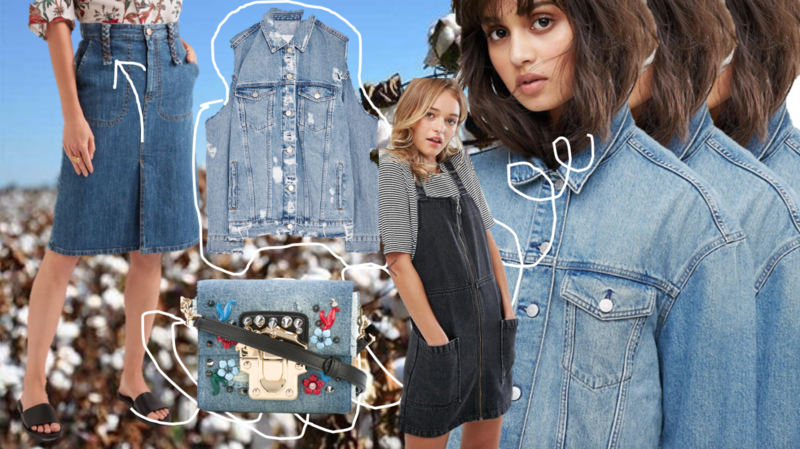 L – R: Skirt -See by Chloé at NetAPorter, Jacket – Zara, Denim bag – Dolce and Gabbana at Farfetch, Dungaree Dress – Monki at ASOS, Jacket – ASOS. Checks and winter have been bedfellows long before there was twitter and instagram and even though it is a trend often visited each year, this season, the tartans and flannels are having a revamp. With lace inserts and embroidery on houndstooth, get ready to invest and wear these modern checks for a few years to come at least. 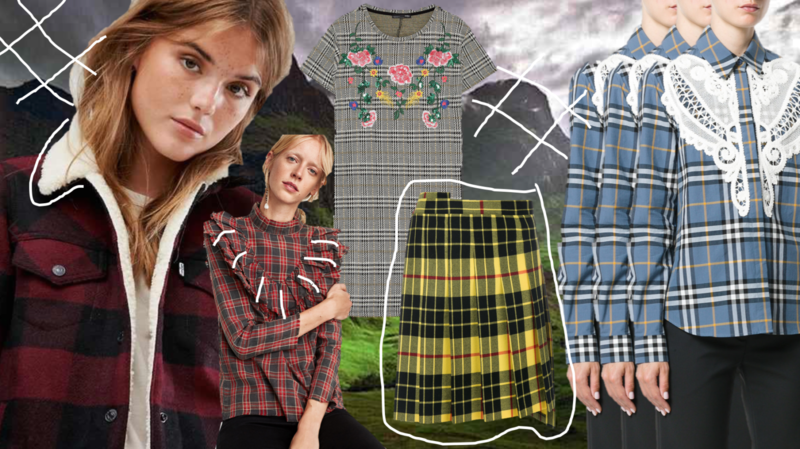 L – R: Red check jacket – Levi’s at ASOS, Red and frill blouse – Zara, Dress – Zara, Kilt shorts – Junya Watanabe Comme des Garçons at Farfetch, Check and lace shirt – Burberry at Farfetch. If you need an outfit for that night out or want to spice up your day wear, velvet is the go-to trend for this season. In baby pink, blue crush and deep red, have fun from now on with this silky, super-soft material. L – R: Pink velvet jacket – Topshop, Black velvet tee – H&M, Red velvet sneakers – Gucci at Farfetch, Yellow top – Boohoo at ASOS, Blue bag – Prada at Net-a-Porter. 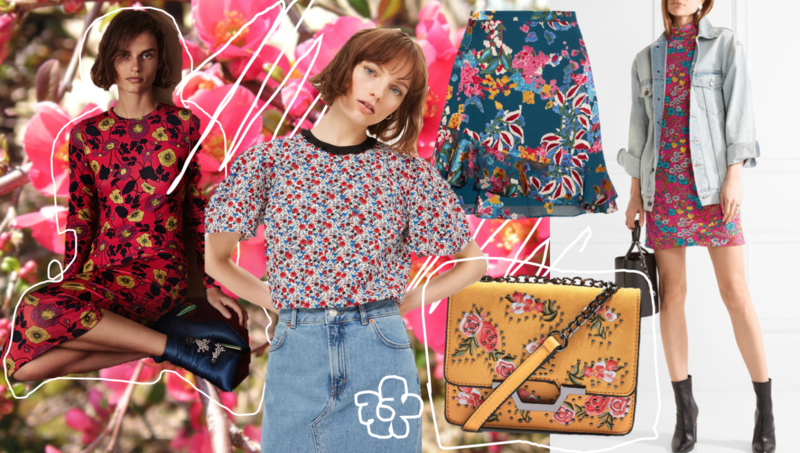 If you need more trend inspiration, Lyst have some great new pieces for the new season on their website from brands such as MSGM, ASOS and Steve Madden.